Mobile Voice-over-IP services promise to save you money by routing voice calls over your carrier’s data network. As more carriers and handsets support high-speed data hookups, such services are proliferating. We looked at four–EQO, Skuku, Skype for Windows Mobile, and Truphone–and discovered that while they’re much easier to use than the ones we tried a couple of years ago, they’re imperfect replacements for conventional voice-call service. Most notably, the call quality remains iffy at best, and in some instances it’s absolutely abominable. Also, depending on your calling habits, you may not see any savings at all. Most services still charge a per-minute rate, so you’ll save on domestic calls only if you’ve exceeded your regular voice plan’s allotment (in which case you might still be better off upgrading your voice plan). If, however, you make a lot of international calls, a mobile VoIP service can save you big bucks. Of the four services we tried, EQO offered the best voice quality, but its rates were significantly higher than the others. 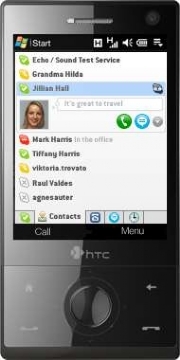 Truphone’s call quality varied, but overall it offered the best mix of features and quality, at a reasonable price. I tried Skype for Windows Mobile 2.5. The company says millions of people have downloaded the software–if that’s true, I can only hope they’ve had better luck with it than I did. After trying in vain (with help from the company) to get the software up and running on an HTC Fuze, I easily downloaded and installed it onto a T-Mobile Shadow. Like the desktop version, Skype Mobile lets you make free calls to fellow Skype users, send instant messages, and transfer files. You can also make calls to non-Skype landlines or to cell phones using SkypeOut, a fee-based service. Skype says its service works best over a Wi-Fi connection, but can function over a 2G or 3G cellular connection. I tested it on Wi-Fi, but the voice quality of the SkypeOut calls I made was miserable, much worse than calls I’ve made with the desktop Skype. Voices were so broken up as to be unintelligible. At Skype’s suggestion, I tried using a headset; though the voices were a little louder as a result, the stuttering and breakups were just as frequent. At least Skype’s rates are reasonable, starting at 2.1 cents per minute. It also offers subscriptions for as little as $2.95 per month–and for $9.95 per month, you can make unlimited calls to landlines in 36 countries. After downloading the free Truphone app from iTunes, I was up and running in just a few minutes. 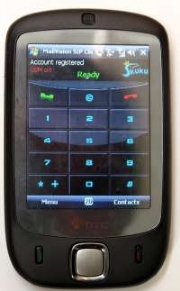 The iPhone version retains the iPhone look–if not for the Truphone logo at the top, you might not even realize that the dialer isn’t the iPhone’s own. 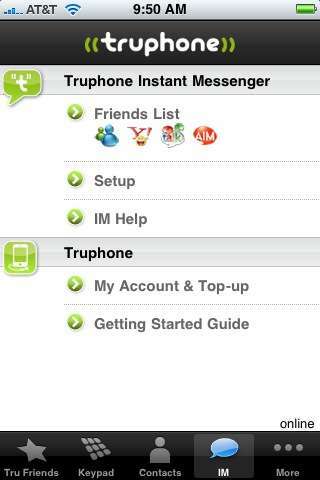 Calls to other Truphone users are free; the service also lets you access your Skype account (a boon for iPhone users waiting for the Skype client), and offers access to the major instant messaging services. In my test calls, the voice quality varied greatly. Some calls sounded hollow, while others had a loud and distracting background hiss. But the service is usable, and its sound quality was far better than that of Skype Mobile. Truphone has two pricing options: TruStandard, which has no monthly charge and rates that start at 5.1 cents per minute, or TruSaver, which costs $4 per month and has rates that start at 2.1 cents per minute. EQO aims to provide a single gathering place from which you can view and connect to all of your contacts via voice calls, SMS text messages, or instant messages. EQO’s software supports AIM, Google, and Yahoo IM; photo sharing (you can embed images in EQO messages or send links via IM or text message); free messaging to other EQO users; the ability to post or follow EQO and Twitter status updates; and RSS feeds. EQO’s voice quality was the best of the four services I tested, but it still wasn’t as good as that of a conventional cell phone call. Voices were less than crisp and sounded slightly hollow, but overall everything was understandable. EQO’s rates are substantially higher than those of the other services, starting at 2.3 cents per minute. And even calls between EQO users aren’t free: They’re half the cost of out-of-service calls. Skuku’s principal current product is slightly different from the others I tested for this story. Designed to eliminate international roaming charges for calls made to the United States from overseas, Skuku requires a PC and Skuku hardware–either a USB stick or a handset into which you insert the SIM from your GSM handset. You connect the Skuku stick or handset to a PC’s USB port, and Skuku’s PC software routes calls to the company’s servers, which use your SIM info to place the call virtually from your U.S. carrier. The downside of this approach is that you’re tied to a computer, but Skuku is working on a Windows Mobile version of its software for GSM handsets (the company says it will release the app for HTC handsets this spring). I tested an early version, which requires a Wi-Fi connection, and found the voice quality so-so. Calls sounded very fuzzy, with lots of static and a noticeable echo, but I could hear my callers and they could hear me. Skuku’s mobile app will likely be free, with service fees similar to those for the PC-based application (about $2.50 a day or $12.50 per month). It’s a good deal for travelers who want to call home cheaply, but you’ll still have to pay roaming charges for calls from one foreign country to another. While the voice quality of the four services I tried would not win any awards, they could save you serious money if you make a lot of international calls. Since the software is free, you might want to try them out yourself to see if one of them works for you.